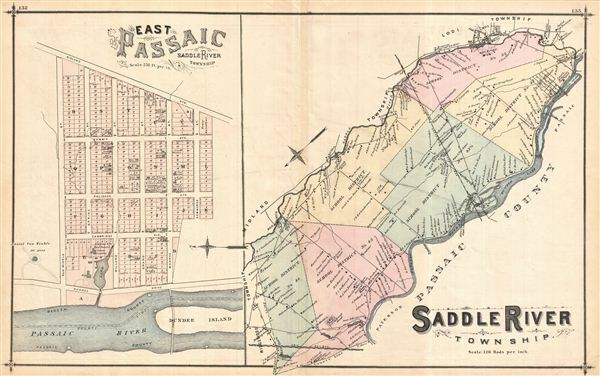 1876 Walker Map of Saddle River Township, New Jersey w/ East Passaic. Exquisitely detailed 1876 map of Saddle River Township, New Jersey, showing roads and property owners' names. With an inset of East Passaic showing numbered property lots. Notable is the early depiction of school district boundaries in a state that today publicizes the high quality of its schools in the context of property values. Published as plates 132-133 in Walker & Pease' exquisite 'topographical, illustrated, historical, descriptive' Atlas of Bergen County, New Jersey, 1876. On verso appear two absolutely lovely lithographic views of two area residences.